Remember the days of the Scholastic Bookfair when you got a free poster if you bought three books? It was a kitty hanging from a tree branch and it said “Hang in there!” Or it was a hot car or some galloping horses. 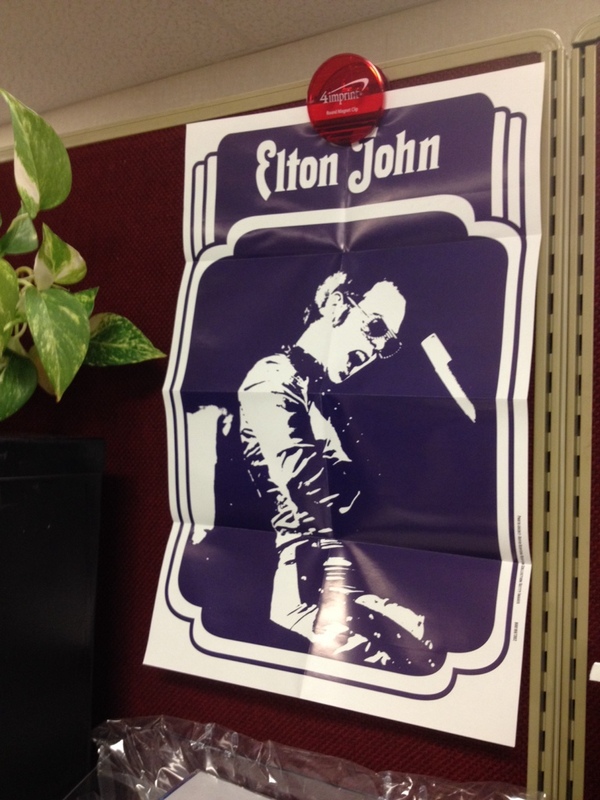 I recently bought the latest Elton John CD (yes, I said CD) and it came with a poster. It made me laugh and think what adult hangs up a poster these days? So I hung it up in my cube at work. I wish we still had Bookfair, don’t you? You are welcome, Leslie! It’s funny to recall the little things that made us so happy as children, isn’t it? I remember missing the book fair one year due to chicken pox. My mom went to the school to purchase a book I had wanted so badly that I’d seen at the preview the week before. It was Charlotte’s Web, but I didn’t know the title. All I knew was there was a pig on the cover and a girl holding the pig and some other animals around them. Mom found it! Not sure whatever happened to that book, but I wish I still had that copy.